Farmer Jack was once dubbed 'A&P's Most Successful Branch' of the corporation. It was also considered one of the largest chains to go out of business... wait, what? 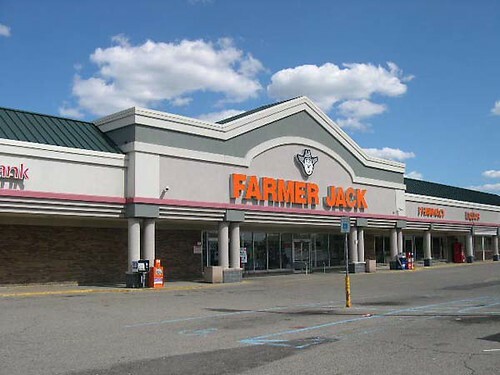 Farmer Jack, at liquidation in July 2007, had around 80 stores. 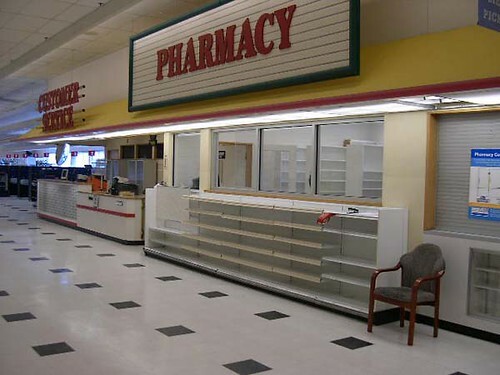 Most being sold to Kroger; but many are still abandoned now, or have been demolished, and rebuilt into new stores. Today we take a look at one of the only Farmer Jacks to look at on the web... unless you're looking for an actual Farmer's Jack. Dirtyblueshirt on Flickr treats us with these photos; taken almost ten years ago! A quick look at the front end shows a wide view of the store. Most Farmer Jacks of this standard A&P model had the standard 90's Foodmarket Look we've all come to love at some point; but this Farmer Jack got a rather odd, probably chain-specific decor. 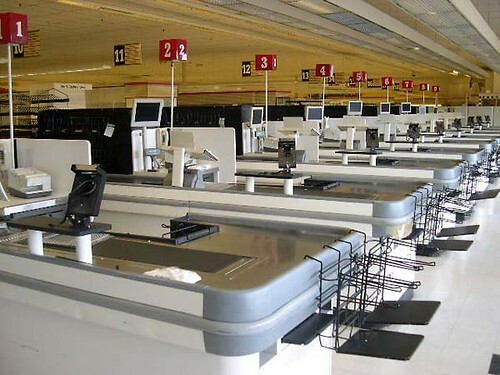 Pharmacy is in its iconic front-end location next to Customer Services and the checkout lanes. Notice the resemblance of the panels to Giant-Carlisle's 90's look (Picture from Acme Style's awesome Limerick, PA post!) I have to admit, if the coloring was slightly updated to a fresher green look, this decor could still work. And check out the floor! 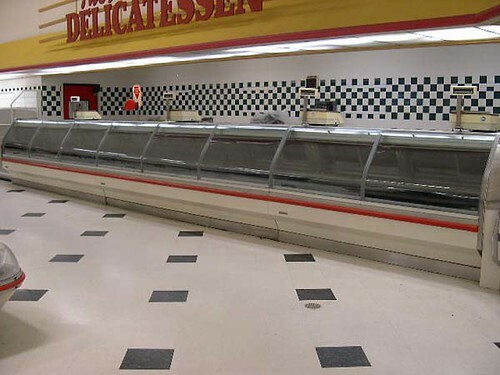 A&P's corporate 90's Foodmarket tiling. Still looks great today! Quick pop-in of some of the service departments along the back wall. A&P's 90's checkerboard tiling along the back wall looks all the better with the custom Farmer Jack decor. 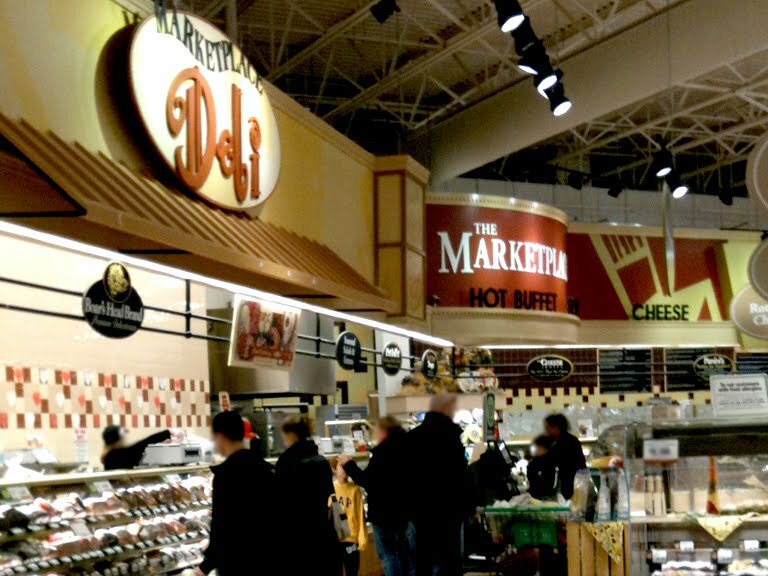 Although this is a very brief look inside a Farmer Jack, it gives us a great look at A&P's most successful branch of the chain, and how they did it-- all with the ambiance and low prices of their stores. Not built as a Centennial. This was originally a Farmer Jack Home Center, opened in '71, I think. Home Center had a bit of general merchandise and I think a pharmacy, at least in this one. Got picked up by an independent not long after the closing, now it's Value Fresh, supplied by Spartan Nash.